There is nothing like eating fish you catch yourself. We are up in Nantucket taking a short vacation with the family. The day after our arrival, my father and I caught a few bluefish and cooked them that evening with my dad’s classic “slather in mustard-and-mayo, then saute” method. This trip, our St. Lucian nanny, Clothilda, also came with us and she offered to make her curry fish stew if we caught some more. Talk about a motivator! We were on a mission. It took some determination and patience, but we finally landed ourselves a couple more blues and last night Tilda made her stew while I played sous-chef and took notes. A few hours before cooking, cut the fish filets into single-serving portions and sprinkle each side with a pinch of salt and pepper and fresh lime juice. Cover and return to the fridge until you cook. Heat up the olive oil on medium high heat and add all the vegetables except for the sliced tomatoes (these get saved for the very end). Saute together for several minutes, then add the curry, turmeric, the tomato paste, about 1/4 tsp of table salt and a big pinch of black pepper. Taste for salt and heat. If you want it hotter, add more hot curry powder or some crushed red pepper flakes. Once all the vegetables are cooked, remove half to a bowl and turn the stove burner down to low. 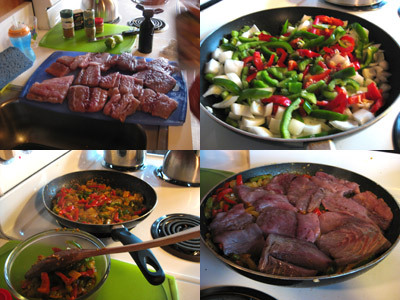 Place the filets on top of the vegetables still in the pot and squeeze the juice of a lime over the filets. 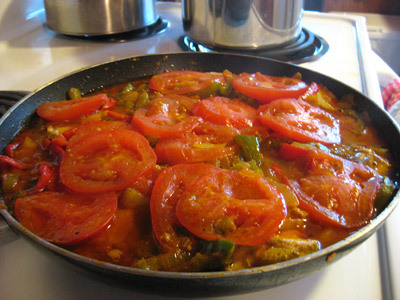 Cover the fish with the remaining vegetables and then layer the thin slices of tomatoes on top. Cover the pan so that the fish will steam, and cook for 15 to 20 minutes (if you are using a thinner filet like tilapia, check the fish after 10 minutes). Taste for salt and pepper, and serve with rice. Delish! 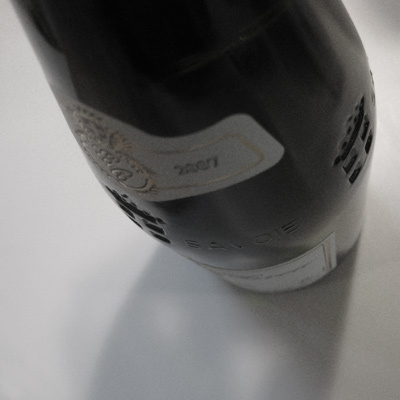 I only like to blog the successes unless there is humor or an interesting lesson in the duds. “Giff is an idiot” doesn’t qualify as a lesson. Too obvious. I am pleased to say that last night’s meal was an unqualified success. Even I, who tends to be hypercritical of my own dishes (to Lisl’s annoyance), loved this. 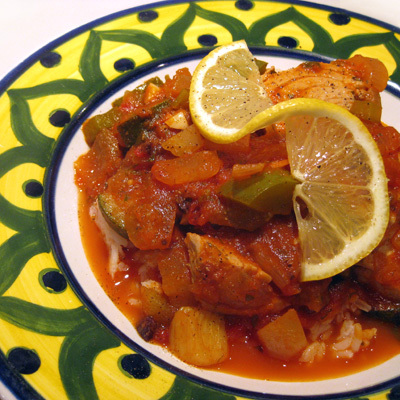 Essentially, you make a really good vegetable stew with provencal flavors, and then finish it off with the fish and serve on a bed of rice. Most satisfying! Our fishmonger had some really good looking tuna, so I had him cut some 1/2 slices adding up to just over a pound. I think a firm fleshed fish like tuna or halibut is best for this recipe. We served this dish with a delicious white wine from the Jongieux region in France called Carrel Vin de Savoie, and some freshly baked bread. In a dutch oven or stew pot, heat up a splash of olive oil on moderate heat and saute the onions until translucent. 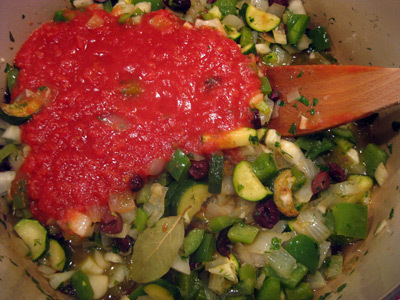 Add in the zucchini and cook for 5 minutes, then add in the chopped celery, fennel, green pepper and garlic, along with a couple pinches of salt (not too much since the olives will add saltiness). Continue to saute for another 10 to 15 minutes, stirring occasionally and letting the vegetables get tender. Finely chop the parsley and fennel frond and add to the pot. 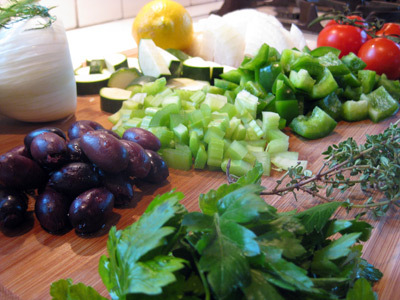 Toss in a bay leaf and a large sprig of fresh thyme, along with the 1/2 cup of white wine, 1/2 cup of water, crushed tomatoes, kalamata olives, and juice from half a lemon. Stir all together and cook on a light simmer for another 10 to 15 minutes. 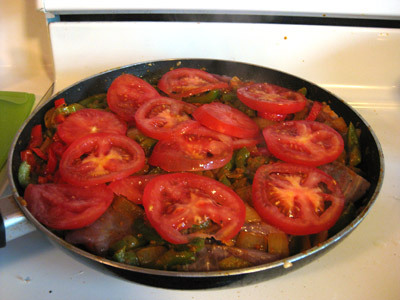 Thinly slice the tomatoes and add to the pot. Thinly slice the red onion into rings and stir into the pot. Cover and continue to cook on a light simmer for 20 to 30 more minutes, letting all the flavors meld together. Taste for salt and pepper. Slice the tuna into rough cubes about 1/2 to 1 inch a side. Start cooking your rice. When your rice is 5 to 10 minutes from being done, add the tuna to the stew pot. The fish should only need 5 to 10 minutes to become firm and cook through, no more. 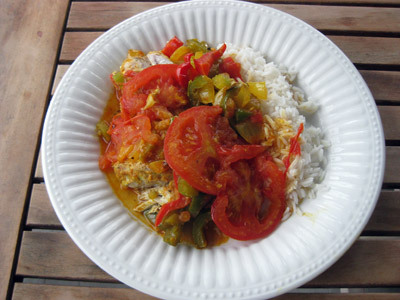 Plate by spooning a mound of rice into a bowl, ladle the fish stew on top, and then grind a little fresh pepper. I was mentally preparing to braise a pork shoulder today when I happened upon Kalofagas this morning. One look at Peter’s grouper baked in parchment paper, and my brain said, “now this is what you want!” Lisl and I are both suffering from colds, and the light taste of Mediterranean summer just seemed perfect. Indeed, it was so. A segue: I’m very picky about the freshness of my fish, and until I find a fishmonger I trust, I tend to stay away. When I lived in San Francisco a decade ago, I would trek out to the Chinese markets in Sunset because the freshness was so superior to the normal supermarkets. We’ve now been in Rye, NY for two years, but I will admit that it took Peter’s post to get me to test out a fish market in Port Chester. The upside is that I was very impressed. One look at the eyes of the whole snappers behind the glass and I knew that they dealt in fresh fish. Back to this recipe, the amounts here feed two quite nicely. It’s a delicious, fast meal to put together, and the ingredients are quite similar to how I like to cook mussels. The below is similar to Peter’s recipe, but not identical, so I recommend you check out his blog as well if you haven’t already. Heat up a splash of olive oil on medium-low heat and saute the onions and garlic for a couple of minutes. 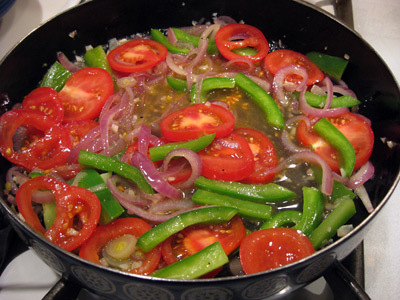 Then add in the green pepper, saute for a few minutes. Then add in the vermouth and a couple pinches of salt and pepper. Cook for a few more minutes then remove from the heat. Lay the halibut on a piece of parchment paper that extends several inches past the length-wise ends of the steak. 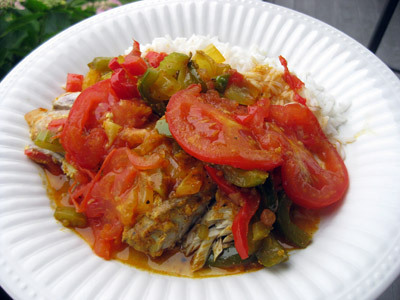 Sprinkle a little salt and pepper on top, then spoon out the vegetables and liquid on top of the fish. Sprinkle a pinch of dried basil leaves on top, dot a few oregano leaves around, and place two slices of lemon on each end of the steak. 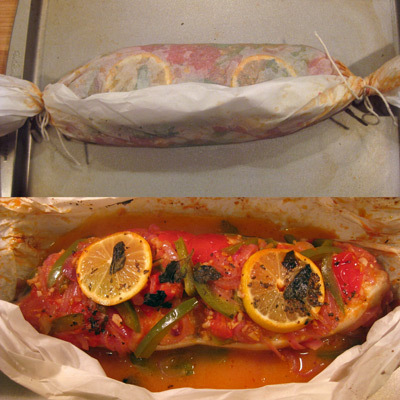 Fold the sides of the parchment paper up towards the middle and tuck one over the other and refold a few times to create a seal and get the paper snug with the fish. Twist each end of paper and tie off with kitchen string. Place on a baking tray. If you have too much parchment paper hanging off the ends to fit in the oven easily, trim with scissor. Bake for 15 minutes, then check one of the packets. If you have a steak, remove the backbone from the middle, carefully half the fish, and plate. Spoon the delicious broth over the top. 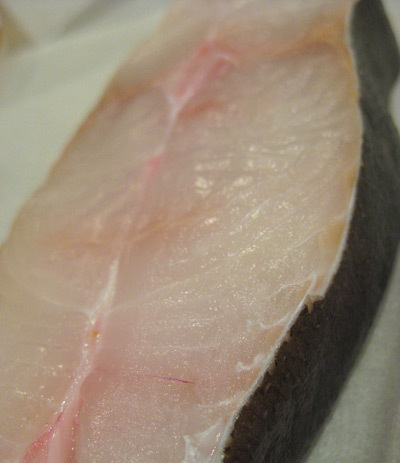 I kept the below picture of the halibut steak because it interested me. I can’t quite put my finger on why; perhaps because it has that grainy, soft-focus, de-saturated look I adore in Orangette’s pictures. P.S. Now that I’m cooking fish again, I have to tackle an interesting but never-attempted technique: baking a whole fish packed in salt.